It all began in 1954 when a young boy’s mother found a math test in his pocket. That boy’s name was Takeshi Kumon, and he was in his second year of elementary school. Seeing that his test results were not as good as they usually were, his mother consulted her husband about what to do. Her husband was Toru Kumon, a high school math teacher at the time. To address his wife’s concern, Toru then began making math worksheets for his son, Takeshi. 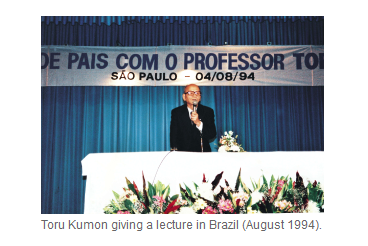 Toru Kumon believed that the work of an educator is to foster a mindset for self-learning in children. So he went through much trial and error when creating learning materials for his son so Takeshi would be able to work comfortably with the materials each day and to steadily develop his skills. Based on his experience as a high school teacher, Toru Kumon knew that many senior high school students had problems with their math studies because of insufficient calculation skills. Therefore, he focused on developing Takeshi’s calculation skills, and created materials that made it possible for his son to learn independently. This was because, through his own educational experiences, Toru Kumon knew that students could only gain genuine academic ability by making progress on their own. 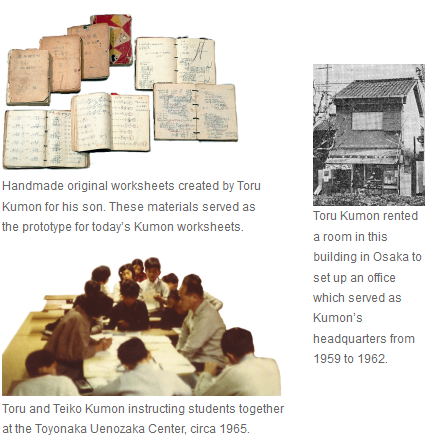 Toru Kumon wrote out calculation problems on loose-leaf paper for Takeshi, and the materials that he created from 1955 became the prototype for today’s Kumon worksheets. Takeshi quickly developed his ability through studying the materials created by his father for half an hour every day. As a result, he was able to reach the level of differential and integral calculus when he was just a few months into the sixth grade. Following his success with Takeshi, Toru Kumon invited some children from the neighborhood to come and study at his home, and instructed them in a similar way to how he had instructed Takeshi. As a result, all of them greatly improved their academic ability. Seeing this, Toru Kumon wished to develop the potential of as many children as possible with his learning method. In 1958, therefore, he decided to establish an office in Osaka and open more Math Centers. From that year the number of Kumon students began to increase steadily. With reaching high school level material through self-learning as the goal, Toru Kumon’s aim was to develop the ability of students to the maximum by enabling them to study at a level appropriate for each individual. Children have an inherent potential to grow. Through their practice of reading, writing, and calculation, students develop the confidence to learn on their own. We at Kumon consider education to be the nurturing of children’s ability to achieve self-fulfillment in the future and realize their dreams and goals. Born out of a father’s love for his son, Kumon is not restricted by the barriers of language, culture or history. As more people hear about the benefits of the Kumon Method, it continues to reach greater numbers of students throughout the world. 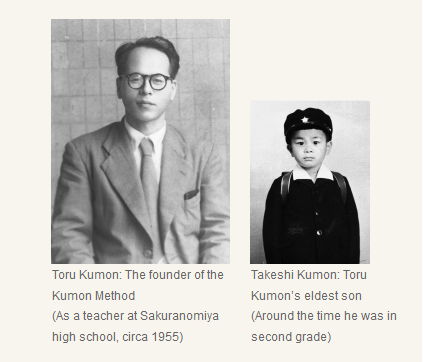 Toru Kumon was born in Kochi Prefecture, Japan. After graduating from Osaka Imperial University (Faculty of Science, Department of Math) he became a schoolteacher. During his 33-year career, he taught math at his alma mater Tosa Junior/Senior High School, and later at Sakuranomiya High School in Osaka City, as well as at other schools. In 1958, he established the Osaka Institute of Mathematics, which later became the Kumon Institute of Education Co., Ltd. in 1983. 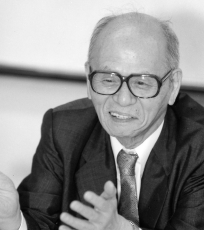 He devoted the rest of his life to improving the Kumon method and making it available to more and more people around the world.